So, much like a few schools I know of, we own a set of "clickers". If you don't know what I'm talking about, think of the popular game show "Who Wants to be a Millionaire" and the "Ask the Audience" bit and you've got the gist of it. It basically allows teachers to quickly gauge student progress and have results displayed immediately. Very nice. The problem with these systems is that they are expensive (we paid around R30,000 for ours) and most schools have only one set that needs to be booked out well in advance. For most teachers, it is simply not worth the hassle. 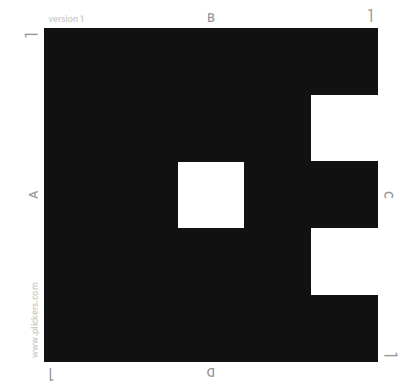 Welcome to the arena: www.Plickers.com. I have only just started using it myself recently, but already the teachers at my school are in love with the idea and have been using it very successfully over the course of the last couple of weeks. 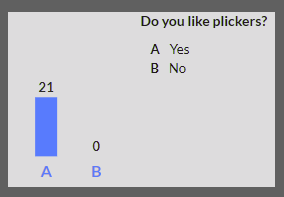 The idea is very much the same as with traditional clickers, although this is what could be called a "low-tech" option. Why? Because all you need is ONE device (a smartphone or tablet will do nicely) and a set of printed cards for each class. Each student is assigned a specific card and they respond to multiple choice questions by holding up the card to the teacher. Their answer depends on the orientation of the card (see image below), as the 4 sides of the image on the card each represent answers A, B, C or D.
An example of plickers card. In this example, the answer would be "B". The teacher then simply holds up his/her device and captures the answers which are displayed in real time on the board behind him/her. NEAT! My experience with it has been near flawless. All it needs is a little advanced planning to think up the questions ahead of time (although I did add one or two in the spur of the moment as well!) and voila! A word of warning: Plickers or any similar tool should be used like most things - with moderation. A recent article on Edutopia discussed research that indicates "...while clickers seem to boost students’ ability to retain factual knowledge, that may come at the cost of deeper conceptual understanding." you've been wared! But...happy plicking!